The title of this series of articles is supposed to be ‘Great Coalition Failures’ – but even a cursory examination of its record on today’s subject reveals that it is not adequate to the depth of the betrayal that is evident. We will be strong in defence of freedom. The Government believes that the British state has become too authoritarian, and that over the past decade it has abused and eroded fundamental human freedoms and historic civil liberties. We need to restore the rights of individuals in the face of encroaching state power, in keeping with Britain’s tradition of freedom and fairness [In the light of the Coalition’s record, this can only be seen as a very sick in-joke for the benefit of the writers]. We will implement a full programme of measures to reverse the substantial erosion of civil liberties and roll back state intrusion [It seems state intrusion in our lives has never been higher]. We will introduce a Freedom Bill [This happened. It was a Nick Clegg idea and includes measures mentioned elsewhere on this list. Of the others, the proposed restrictions on police stop-and-search powers seem laughable, following the furore over the stopping and searching of people during the ‘racist advertising van’ debacle of 2013 – because they looked foreign]. We will scrap the ID card scheme, the National Identity register and the ContactPoint database, and halt the next generation of biometric passports. We will outlaw the finger-printing of children at school without parental permission [This is in the Protection of Freedoms Act]. We will extend the scope of the Freedom of Information Act to provide greater transparency [Attempts to secure up-to-date figures on the number of benefit claimants who have died as a result of government ‘reforms’ shows that the Coalition has made a mockery of the Freedom of Information Act. For a run-down of the ways in which government departments may dodge their responsibilities, see this article]. We will adopt the protections of the Scottish model for the DNA database [DNA database protections are in the Protection of Freedoms Act]. We will protect historic freedoms through the defence of trial by jury [A lie. The Conservatives and Liberal Democrats have started ‘secret’ trials, in which a person can be convicted without ever knowing the offence of which they are accused, seeing any evidence or having any chance to mount a defence against it]. We will restore rights to non-violent protest [This has not happened. It seems clear that the response to any such street protest that our current government dislikes will involve the employment of water cannons. Free speech is covered by changes in the libel laws that protect outsourced government services from criticism, and then there is the Gagging and Blacklisting Act, which was supposed to be about government lobbyists but became a tool of repression]. We will review libel laws to protect freedom of speech [Conservatives blocked changes that would force private companies to show financial damage before being able to sue others for libel. This means government-owned prisons may be criticised without fear of legal action but privately-run prisons cannot. With so many government services being outsourced or sold off, this effectively neuters any relaxation of libel law as far as criticism of the government itself is concerned]. We will introduce safeguards against the misuse of anti-terrorism legislation [This is in the Protection of Freedoms Act]. We will further regulate CCTV [This is in the Protection of Freedoms Act]. We will end the storage of internet and email records without good reason [Depending on your point of view, this is a lie. What constitutes “good reason”? The Data Retention and Investigatory Powers Act tramples all over any definition]. We will introduce a new mechanism to prevent the proliferation of unnecessary new criminal offences. We will establish a Commission to investigate the creation of a British Bill of Rights that incorporates and builds on all our obligations under the European Convention on Human Rights, ensures that these rights continue to be enshrined in British law, and protects and extends British liberties. We will seek to promote a better understanding of the true scope of these obligations and liberties [This is an outright lie. The Bill of Rights, as proposed in recent weeks, will remove obligations that were placed on us by the ECHR, and lay the British people open to abuses of their civil liberties on a scale not seen for many years. The stated desire to promote a better understanding of civil obligations and liberties may be discounted as it is not in the government’s interest to tell people about freedoms that are being legislated away from them]. 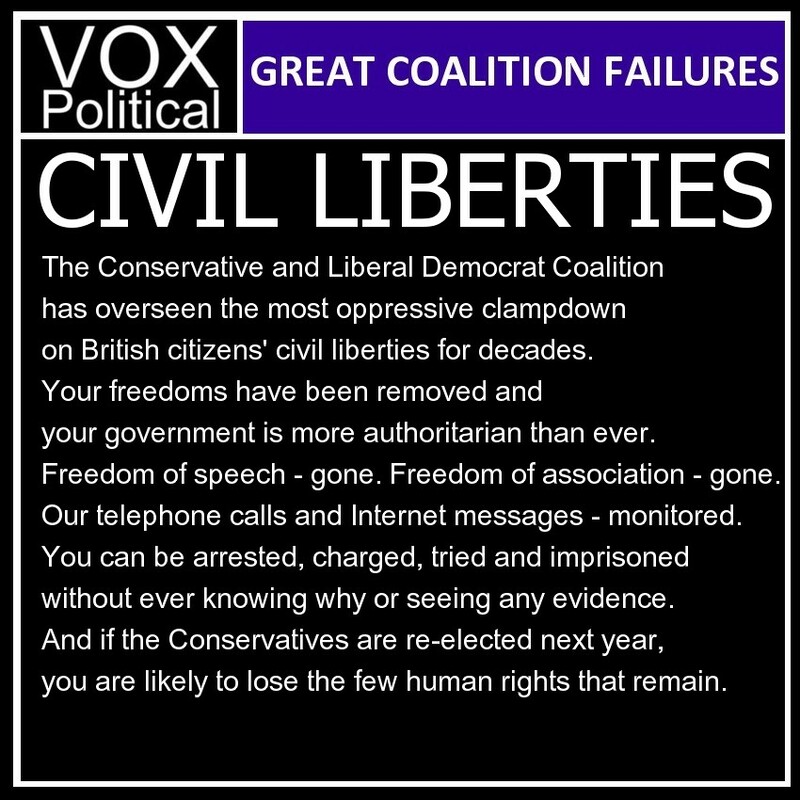 The verdict: The Conservative and Liberal Democrat Coalition has overseen the most oppressive clampdown on British citizens’ civil liberties for decades. Freedoms that we had four years ago are now distant memories. Freedom of speech – gone. Freedom of association – gone. Freedom to join a trade union – heavily monitored, with a threat of blacklisting. Our telephone conversations and Internet communications are monitored. We can be arrested, charged, tried and imprisoned without ever knowing why or seeing any evidence against us. Meanwhile, the government has never been so well-protected against criticism. Government departments have an arsenal of excuses to protect themselves from having to answer Freedom of Information Requests, so you can’t find out what they are doing or the consequences of their actions. Privatised and outsourced government services are immune to criticism as they may sue any critic for libel. Your freedoms have been removed and your government is more authoritarian than ever. If the Conservatives are elected next year, you are likely to lose the few human rights that remain. You didn’t vote for any of this. Does that offer you much consolation? bringing you the best political analysis! Now I wonder why none of this is being picked up or reported by the mainstream press? Very useful to have this put so clearly to confront all candidates – how and when will this be changed??? Mike, not wishing to criticise your journalistic ability I do feel that as well as the above analysis of the lies and deceptions foisted upon us by this rotten coalition there needs to be in a more Sun/Daily Mail/Right wing mindless speak version. For instance the first point in the right wing tabloids would be ” State now spies on us more than ever before”. Second point would be “Coalition fools us with hollow promises”. etc., etc. I am sure that more easily understood headlines could be developed for the Sun/Daily Mail/Right wing mindless speak idiots that would challenge the right wing on its own terms. In a way, that’s a brilliant idea! I wouldn’t want to switch completely, because I’d be accused of turning into a dumbed-down site, but I could run such an article alongside the original. I’ll give it serious thought. Brilliant so well written the truth within it supports my total dislike of the tories sorry I can’t give the word a capital letter. It is so unfortunate your blog can not be exposed by the the national press it speaks words of wisdom and more importantly the facts the public should know about before it is all to late. “Secret trials” extend to ordinary trials which do not involve any “secrets” that might adversely affect citizen’s safety or that of the Country itself. If the justice system stands the slightest chance of being embarrassed even in a minor way, Judges take it upon themselves to issue a ‘bar’ on proceedings even being discussed outside the Court room. I know of such a case which is proceeding at the moment and I also know that there exist others too one only has to look at the blogs which report on such things. Cameron promised that his Government would be one of transparency when he came to power – he has delivered nothing of the sort.